As voters go to the poll today in Jigawa State, the APC will hope to retain the governorship seat. It’s almost a three horse race which will see the APC candidate Muhammed Badaru, SDP’s Bashir Adamu and PDP‘s Aminu Ringim to head to head. Stay with Naija News for live updates as the people of Jigawa vote for the leader and members of the State House of Assembly. Naija News reports that the election later witnessed a high turnout as electorates in all the polling units patiently exercised their civil right. 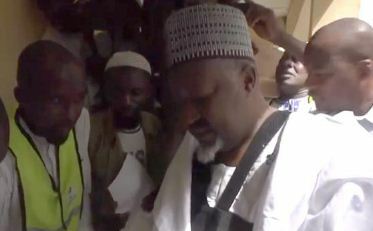 12:09 pm: Governor Badaru Abubakar cast his vote at Arewa ward polling unit in Jigawa State where there was a low turnout of voters. He expressed happiness on the high turnout of the voters and expressed confidence that the APC will win the election. 10: 00 am: The PDP governorship candidate, Mal Aminu Ibrahim cast his votes at Marakawa poling unit in Ringim local government. He also called on the electorates to avoid any act that may breach the peace and stability enjoyed in the state during and after the election. 9:23 am: While INEC made good its promise as polling units opened as early as 8 a.m, voters’ turnout was not encouraging as the people of Jigawa state elect their governor and state House of Assembly members that would serve them for another four years. 10:00 am: Electorates voting peacefully in Bokoto ward, Polling unit 13 also in Dutse. 7: 00 am: The Independent National Electoral Commission (INEC) officials have arrived at their polling centres in Jigawa. In Kasarau and Hospital polling units in Dutse, election officials were seeing displaying election materials.